The fluctuating temperatures in the Midwest during the winter months can create a lot of stress on your rooftop and gutter system. When temperatures reach above freezing during the day, but drastically drop during the evening hours, ice dams and icicles can easily form. Not sure what the difference is between the two ice formations? Read on to learn more about these conditions and what you can do to avoid any damage they may cause. Ice dams are large chunks of ice that form on the edges of your rooftop that can block melting snow from properly draining off of the roof. If enough water backs up behind the ice dam, the moisture can seep under the shingles and can cause extensive interior leaks. These interior leaks can cause a lot of damage to interior walls, insulation, floors and ceilings. If this moisture is not addressed in a timely matter, it can quickly lead to the growth of mold and mildew. Mold and mildew can drastically effect not only the structural integrity of your home, but also the air quality. So how exactly does an ice dam form? Ice dams are created when too much heat is lost through the roof. In order for ice dams to form, the roof must have snow on it. When this snow begins to melt, but ends up refreezing toward the bottom half of the roof where it’s cooler and outdoor temperatures are below freezing, an ice dam can form. One of the best ways to avoid this from happening is to ensure that your home has proper attic insulation and ventilation. You can also try to remove as much snow from your roof as possible. However, accessing your roof at any time can be dangerous, especially in the winter. A roof rake is an inexpensive tool that can help remove excessive amounts of snow from your shingles. When using a roof rake, it’s important to go slow and to not use too much force. Heavy scraping and tugging can cause shingles to become damaged or dislodged completely. Unlike ice dams, icicles usually pose less of a threat, but can easily form in the same areas of the roof. Icicles have an unmistakable shape and typically form on days when the outdoor air is subfreezing, but the sun still warms and melts the snow or ice on your roof. As the snow begins to melt off of the roof, the water freezes when it loses its heat to the cold air. Since icicles rely on sunshine to form, you will typically find icicles on the south side of your home where the sun is the strongest. In extreme cases, poor attic insulation can also be the cause of heavy icicles. Icicles are typically much smaller and less dense than ice dams. If you do start to notice that icicles are forming around high traffic areas such as the front door or the garage, you can gently knock them down with a broom. This will ensure that your family and pets are not standing under the icicles if one or many melt and come loose. However, be cautious if the icicles are large. 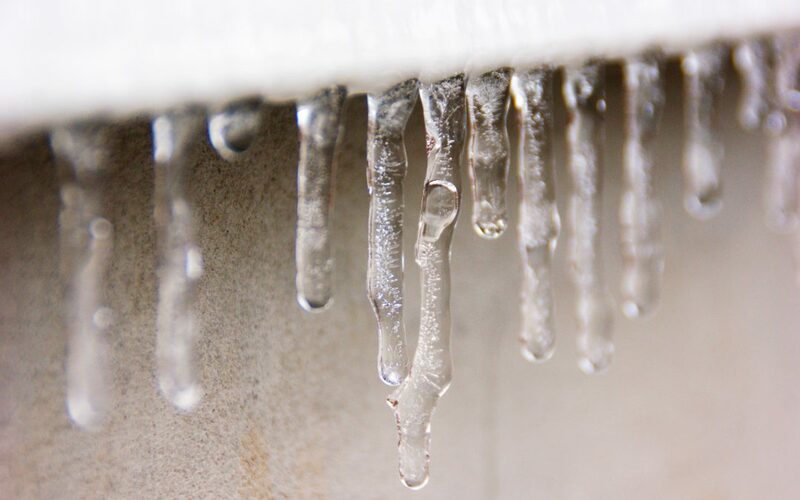 Knocking down heavy icicles could damage your gutters and cause them to collapse. If you have any concerns about your roof or gutters, give our team at Exterior Remodel and Design a call today! Our contractors can examine your home, write-up an estimate, and even walk you through the insurance process to help ensure that you get all of the repair and replacement costs covered. If you need new gutters in the Omaha or Lincoln area, you can trust Exterior Remodel & Design for the highest quality installation or repair. Contact our team today!